On July 30th, rising welterweight Tryon Woodley could entrench a shot at the Strikeforce welterweight title, provided he defeats veteran Paul Daley. A win would not only extend Woodley’s pro record to 9-0, it would be the collegiate wrestling champ’s seventh under the Strikeforce banner. Few would likely argue that it’s the kind of run that leads to title fights. In a recent interview with ESPN UK, however, the outspoken Daley expressed his doubts about whether Woodley has in fact demonstrated that he’s worthy of the praise he’s been receiving. According to Daley, Woodley’s opponents have been “handpicked” by Strikeforce, in an effort to groom the 29 year-old-fighter into a star. 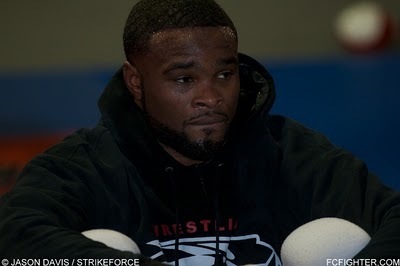 Since signing with Strikeforce in 2009 Woodley has scored victories over several veterans, including Tarec Saffiedine, which Daley cited as the fighter’s most noteworthy to date. One of the key storylines behind the upcoming July 30th bout in Hoffman Estates, Illinois, is whether Daley (27-10-2) will be able to keep the bout standing against Woodley, to make use of his now infamous strikes. Although Woodley has certainly has made use of his pugilistic skills in the Strikeforce cage, one would think that at some juncture he will look to exploit Daley on the ground. For several months now, Woodley has been vocal about his desires to bring the Strikeforce welterweight belt back to his hometown of St. Louis. Although he has to face Daley first, it would appear as though Woodley is within striking distance of making that dream come true.